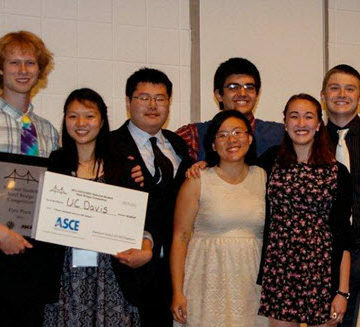 After finishing third in the competition last year, the University of California, Davis (UC Davis) returned this year to win the 23rd Annual ASCE/AISC National Student Steel Bridge Competition (NSSBC), hosted by the University of Akron’s College of Engineering, May 23-24 in Akron, Ohio. A total of 47 student teams and almost 600 registered students and faculty advisors from the U.S., Canada, Mexico, and Puerto Rico participated in the 2014 NSSBC. UC Davis became the champions for the first time since 2005, and for only the second time in the school’s history. For receiving the highest overall score and winning the competition, ASCE President-Elect Robert D. Stevens, Ph.D., P.E., AICP, F.ASCE, presented the UC Davis student team with a check for $3,000 for student scholarships. “We are thrilled about the fact that we won,” says Dawn Cheng, Ph.D., M.ASCE, faculty advisor for the UC Davis Steel Bridge Team and associate professor at the UC Davis Department of Civil and Environmental Engineering. “I know [after finishing third] last year we are getting closer and closer to beating the other teams but I was still shocked that we were able to climb to the top this year. For the second consecutive year, the Massachusetts Institute of Technology finished second and won $2,000, and the University of California, Berkeley, which finished first last year and captured the top prize 3 times in the past 8 years, had the third-highest score and received $1,000 in student scholarship monies. “It was a great honor to be in Akron, Ohio, for the National Student Steel Bridge Competition hosted by The University of Akron, my undergraduate school,” says Stevens, who served as one of the judges of the competition. “[The] bridges were 100% steel and measured about 20 feet in length. Each of the 47 bridges was judged on aesthetics, time to be assembled, weight, deflection under load, and cost of labor and materials. Sponsored by funding from the ASCE Foundation and the American Institute of Steel Construction (AISC), the NSSBC offered future structural engineers the opportunity to display their skills in steel design, steel fabrication, and teamwork. The bridges designed by the student teams were scored by a team of 40 judges in the areas of how long it took to construct the bridge, its stiffness, its lightness, how economically it was built, how it [was] displayed, and how efficiently it was built. 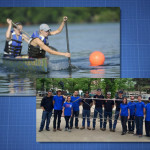 Each year, the NSSBC rules committee tweaks the rules somewhat to offer the students a different challenge, so that they are not designing and building the same bridge each year of the competition. “This was a fun event and everybody seemed to have a good time,” notes David Roke, Ph.D., EIT, A.M.ASCE, assistant professor at the University of Akron and faculty advisor for both the 2014 NSSBC Hosting Committee and the school’s steel bridge team. “Whether or not you go home with any scholarship money, it is still win-win for all the teams that participated. At the end of the day students will leave here with a very positive experience of problem-solving and working together as a team. In addition to ASCE and AISC (American Institute of Steel Construction), the organizing sponsors of the NSSBC include, the American and Iron Steel Institute, the James F. Lincoln Arc Welding Foundation, the National Steel Bridge Alliance, Nucor Corporation, Nelson Stud Welding, the Canadian Institute of Steel Construction, the Structural Steel Education Foundation, Bentley, the American Galvanizers Association, and DSS Solidworks. “The students who put all of their time and effort into Student Steel Bridge Competition are the ones who you know are going to succeed, whether they want to get jobs in structural engineering or…in geotechnical construction management,” concluded Roke. “Because of what they learned from this experience, these students have what it takes to look at a problem, work together, and find a solution – all the practical skills that are needed in engineering and out of engineering. Congratulations to all the UC Davis Steel Bridge participants!! great job of designing, fabricating, and assembly of the bridge. keep up the great work.